BEES NEED TO KNOW ! 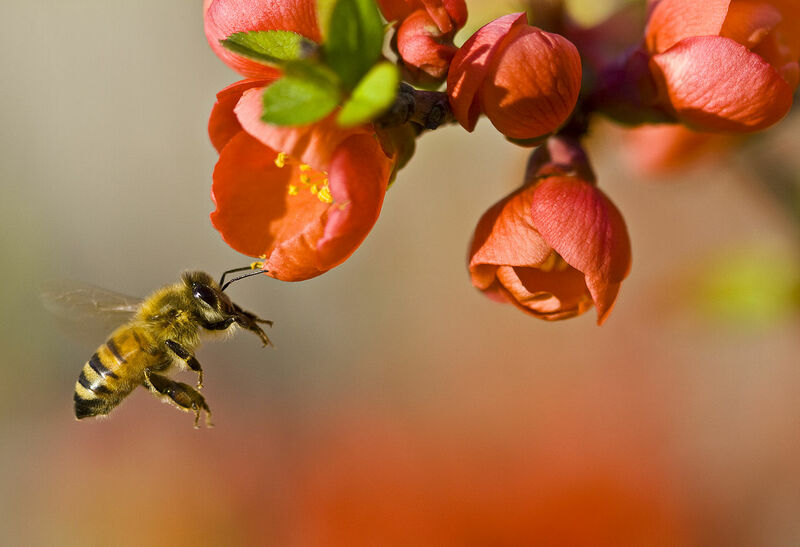 Bees are amazingly active – and they display God’s power and genius in many detailed ways. But don’t think that bumblebees are limited to the six senses that humans use (seeing, hearing, smelling, tasting, and feeling physical contact) for observing the outside world. Humans need sensory information just to survive; so do beasts. 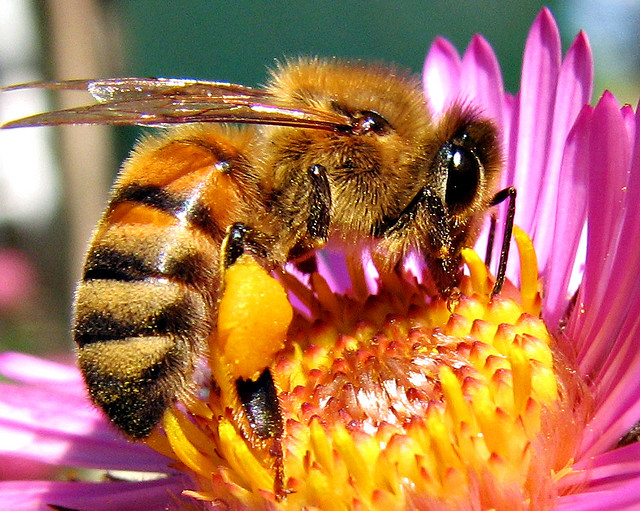 The brain of the bee is composed of a mere one million neurons (nerve cells), 0.01% of the neurons of a three-pound human brain. Using this tiny bee brain and associated vision, bees have been able to solve complicated color puzzles and even recognize human faces. They do this by using their 6,300 ommatidia that comprise the eye. Bees have also been created with the ability to distinguish up to 300 separate flashes of light per second, an attribute they use as they rapidly fly over the changing landscape. In other words, like other animals, bees routinely need and get accurate and immediate visual information about their immediate (and not-so-immediate) surroundings — yet bumblebees also acquire data around themselves using another physical sense the existence of which we are just now learning about. Bumblebees feed on nectar from flowers. It is thus advantageous for them to find flowers efficiently, expending as little energy as possible when searching for food. It turns out that all living things, even flowers, have electrical fields. The student of [God’s] Creation will not be surprised to find that the body hairs of bumblebees possess a unique ability, in that they are sensitive to electrical fields, specifically, those produced by flowers. 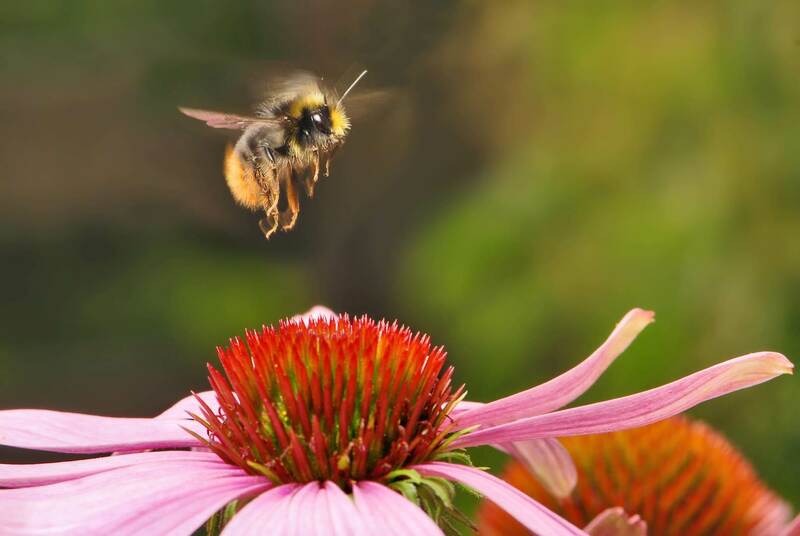 In addition to other fine-tuned senses bumblebees possess, including the ability to see ultraviolet light, the body hairs of bumblebees move in response to electrical fields. These hairs, called “mechanosensory hairs”, are connected via nerve fibers to the bumblebee nervous system, and when they move, they activate the nerve cells. These sensory hairs allow bumblebees to forage for nectar more efficiently by enabling them to sense electrical charges on flowers. But what do bees do with all of the data they receive, all of which is highly quantified in detail? Interpreting all of the collected data — sights, sounds, even electrical field data – requires the equivalent of a super-computer to analyze, yet bees (as small as they are) have no difficulty with instantly processing math-loaded information as if their little lives depended upon it – which they do. Bees can solve complex mathematical problems that would normally keep computers busy for days, according to a new report from UK researchers. Through careful observation, University of London scientists have determined that bees routinely solve the “traveling salesman problem,” in which a subject must determine the shortest route between multiple destinations in order to conserve energy. But the scientists don’t know how the bees do it with a brain the size of a grass seed. 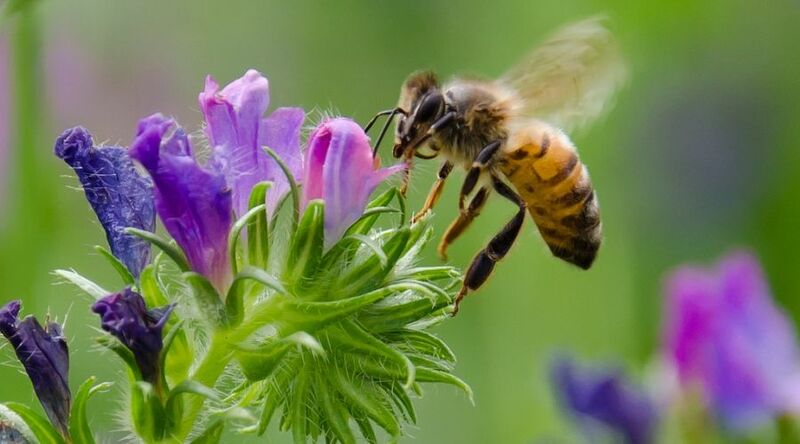 “Bees learn to fly the shortest possible route between flowers even if they discover the flowers in a different order,” according to a Royal Holloway, University of London press release. Researchers watched as bees encountered “computer controlled artificial flowers” at random, then quickly calculated the shortest route before visiting them all again. Current computer programs that perform these kinds of calculations operate by totaling the lengths of each possible route and then comparing them to find the shortest one. There is no way that such tiny brains, using such little energy, could arrive at the right answer so quickly and consistently using the same approach as these computers. 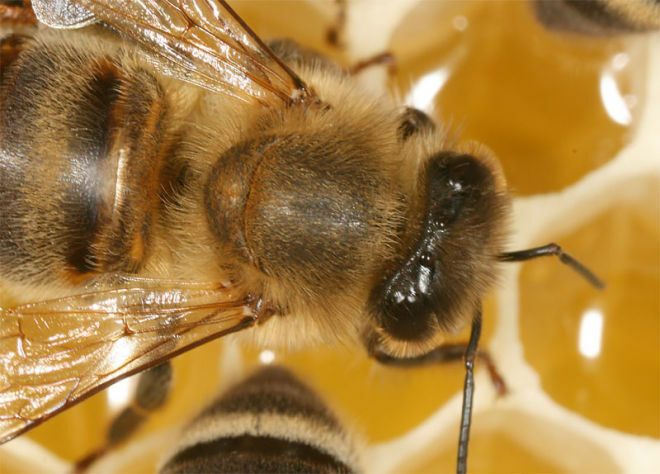 So, the researchers speculated that the bees must be using an unknown shortcut algorithm. Such an algorithm could be a valuable assistance in solving traffic flow problems on roadways and in man-made data networks. Also crowded into a bee’s tiny brain are other shortcut algorithms that enable bees to completely avoid crash landings. Research has also discovered advanced capabilities in other insects. For example, ants possess superior traffic flow instincts compared to man-made systems. And even slime mold can build more efficient transportation tracks than those devised by Japanese railway engineers. All of these algorithms, if they could be discovered or reinvented, have the potential for use in human designs. Thus, bees do their personal research and analysis quickly, using brains so small that their behavior is inexplicably baffling – unless we keep in mind Who designed and constructed and maintains the bioengineering and life of each humble bumblebee: the Lord Jesus Christ, Who delights in confounding the supposedly “great” by what is “little”. (1) Irwin A. Moon, City of the Bees (Moody Science Classics movie, 1962), now available on DVD. Dr. Irwin Moon, who influenced Dr. Henry Morris, should be recognized as the “morning-star” of the Biblical creation revival movement. (2) Compare similar text, applied to how freshwater fish need to know, in James J. S. Johnson, “Even Fish Need to Know!”, Acts & Facts, 45(1):21 (January 2016), posted at http://www.icr.org/article/even-fish-need-know . (3) Quoting Frank J. Sherwin, “Un-Bee-lievable Vision”, Acts & Facts, vol. 35, issue #2 (February 2006), posted at http://www.icr.org/article/un-bee-lievable-vision/ . (4) Quoting Jonathan C. O’Quinn, “Electric Bumblebees”, CREATION MATTERS, 21(4):12 (July-August 2016), citing G. P. Suttona, et al., “Mechanosensory Hairs in Bumblebees (Bombus terrestris) Detect Weak Electric Fields”, PNAS [Proceeding of the National Academy of Sciences], 113(26):7261-7265 (2016). (5) Quoting Brian Thomas, “Bees Solve Math Problems Faster Than Computers”, ICR News (posted November 2nd AD2010), posted at http://www.icr.org/article/bees-solve-math-problems-faster-than .